Get outside in the sun. Soak up some rays and absorb the benefits we all need more of. Get away from blue light and into the sunlight. See one of my last posts for a more detailed look at all the benefits from sun exposure, here. We all need time to think. The automaticity of our lives is powerful and productive. But, for us to develop and advanced beyond our current states, whether it’s in work, our relationships, the gym, we have to create space and time to allow the mind to get creative and explore; to refine our current modes of thought; to challenge our stances on issues we might wrestle with. We need space away from the noise to allow the conscious mind to run free. For anyone who’s visited the mountains or locations of higher elevation from sea level, you know that sensation when the smell of fresh air and pine trees hits your olfactory receptors triggering your emotional centers in the brain releasing nostalgic feelings of joy and happiness. The same can be said for a peaceful beach against the coast in a quiet town. As our world continues to develop, we forget about the value and euphoria of breathing in fresh air. For those of us who are close to locations where that can be experienced, utilize this forgotten tool as often as you can. One of the key pieces we always advocate for is easy aerobic work to promote blood flow and recovery. The recovery extends beyond the physical body and includes our mind as well. Getting outside, moving blood, promoting regeneration, creating a space to think, and appreciating all that’s around you. 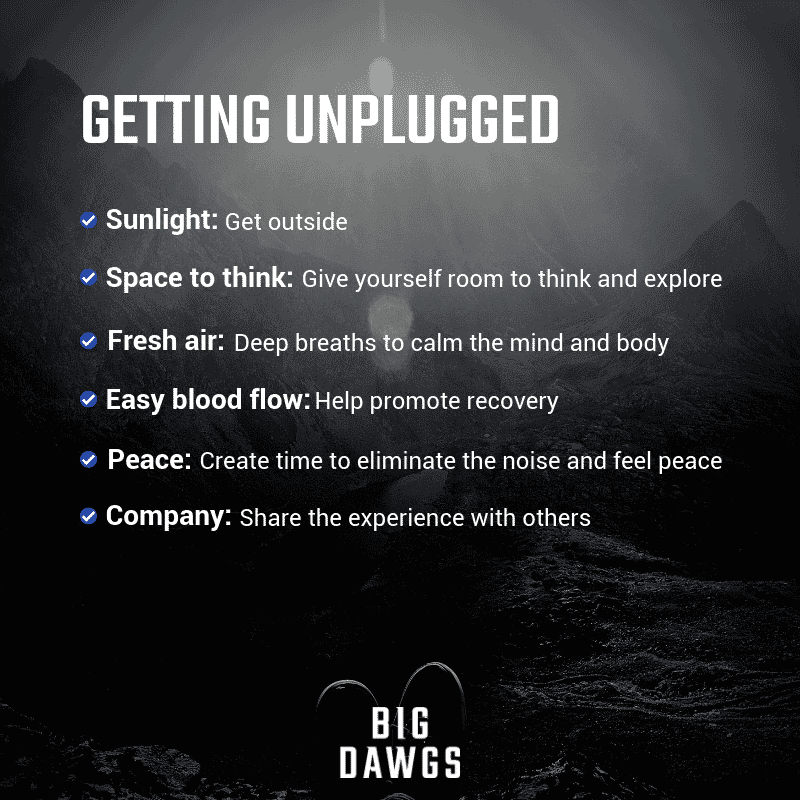 All of these things go hand and hand with easy blood flow as a tool to use to get unplugged. This ties into idea number 1 and 2 but aims at a different perspective. While time away from technology and stimulation can help us wind down, breathe, and be creative it can also allow us to cultivate peace. If there is one thing we as a society have move further away from in the last 20 years it would be accumulating peaceful moments on a weekly basis. For those of you who might describe yourself as more “high strung” or “type A personality” I challenge you to block off time during your week to allow peace and no noise. Feed the polarity of your essence and watch yourself develop in ways you didn’t think possible. Share getting unplugged with others you enjoy spending time with. Use it as an opportunity to spend time uninterrupted. When was the last time you had a deeply engaging conversation or shared an extended period of time with someone? It has become more difficult for our culture to “find” time to do things of this nature because it REQUIRES putting aside things believed to be more valuable and important. I challenge you to start making time to get outside, alone, and also with someone you enjoy talking to and spending time with. Sunlight: Get outside in the sun. Space to think: We need space away from the noise to allow the conscious mind to run free. Fresh air: The smell of fresh air and pine trees hits your olfactory receptors triggering your emotional centers in the brain releasing nostalgic feelings of joy and happiness. Easy blood flow: Easy aerobic work promotes blood flow and recovery, which extends beyond the physical body and includes our mind as well. Peace: Block off time during your week to allow peace and no noise. Company: Share getting unplugged with others you enjoy spending time with and use it as an opportunity to spend time uninterrupted.